This toy has lasted the test of time. My 4 year old had it and now my 10 month old has (when my 4 year old deems it acceptable…. shes fallen back in love with all of her baby toys!!). Its a great toy. Lots to look at, hear and feel. My husband thinks it looks like a dog toy but what does he know? I read the review about giving to their pet dog and decided to give this a go. Yep he loves it so I guess it has a dual purpose when baby grows older and puppy gets to play with it. These are an excellent toy for Bub. Very strong and well made and good value for money. Great chew toy or something to keep little hands busy. I put mine in the dishwasher to keep clean. Our little one loves this and his young cousin has her eye on it too. He is attracted by the colours more than the sound of the rattle. I brought one for my son when he was 1 year old and my fiance plays with it just as much. As well as the cat and dog everyone gets involved they are well made simple and fun. This was a great toy when we first got it, but bubs quickly lost interest. He did love the rattle noise of it. I expected he’d like the different colours and the textures.. but nope… just the rattle. great for 8mth old niece! I gave this toy to my baby while shopping and it kept her busy the shopping trip, she loved it. The rattle, colours and twist kept her attention. We brought it (since she also enjoyed chewing on it) and she still plays with it. 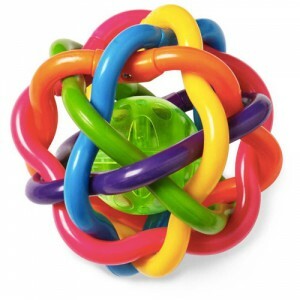 How would you rate Playgro Bendy Ball Rattle?